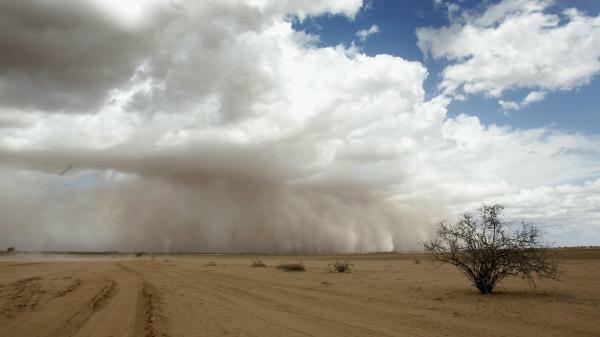 A dust storm moves across the barren plains of northern Kenya in March 2006. Viruses are swept up into the atmosphere via dust storms and ocean spray, and then fall back down to the surface. Scientists now think they understand why so many viruses seem able to exist in widely varying ecosystems on Earth. There are an enormous number of viruses that get sucked up into the outer atmosphere and then fall out of the sky and scatter across the globe, according to new research published in the International Society for Microbial Ecology Journal. Researchers set out to measure the number of viruses that are swept up from the Earth's surface and into the layer of atmosphere between weather systems and below the stratosphere. Scientists believe that studying these viruses could help inform why similar viruses are able to spread across the planet. By searching the skies from atop the Sierra Nevada mountains in southern Spain, the team discovered a whopping number of viruses that lie above 9,000 feet. For almost 20 years, scientists have been puzzled as to why essentially identical viruses were observed in remarkably diverse environments, says University of British Columbia virologist Curtis Suttle, one of the authors of the study. "The thing that's remarkable about it is it just shows how far they disperse," he tells Here & Now's Eric Westervelt. "So we might find a virus in a meltwater pond in an Arctic ice shelf that seemed to be identical to another virus that was in the Gulf of Mexico to another virus that was in a lake in Germany." Viruses are carried into the planetary boundary layer, the lowest level of the troposphere, the closest atmospheric level to the Earth's surface, via sea spray and soil dust, Suttle says. "Every day, more than 800 million viruses are deposited per square meter (11 square feet) above the planetary boundary layer," he says. Among the viruses, scientists found much less bacteria in the planetary boundary layer – just tens of millions per square meter. It may sound like something out of a science fiction movie, but it's not quite so perilous. Suttle explains that early all of the viruses circulating and dropping from the Earth's atmosphere actually help regulate ecosystems across the planet. "So many of the viruses – and perhaps just about all of them — in fact, are keeping planetary processes going on," he says. "So almost all of these viruses infect the microbes that are in the ocean and on the surface of the Earth. So essentially ... none of these microbes statistically speaking would infect humans, so it's not something we have to worry about." The larger concern to humans is the introduction of more particles in the atmosphere, which can lead to respiratory issues, Reche told Newsweek. Climate change is responsible for pushing more microbes into the atmosphere. "Climate change increases soil erosion and hurricane dynamics," she said. "Soil erosion – mostly in arid and semiarid regions – is increasing the exports of dust to the atmosphere and the microorganisms associated with this dust."